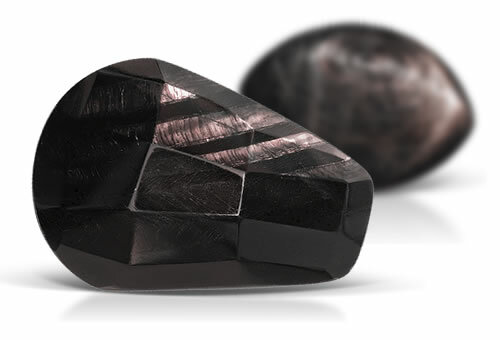 Hypersthene is a common mineral in the pyroxene group that rarely forms distinct crystals. Its name is from a Greek word meaning "over strength," referring to its hardness. It is usually brown, green or gray with vitreous to pearly luster and displays a brilliant coppery metallic surface sheen. Misnomer: Hypersthene has been discredited by the CNMMN Pyroxene Subcommitee in 1988 and it is used as a synonym for enstatite or ferrosilite. Hypersthene displays a copper red schiller or sheen caused by tabular inclusions of hematite and goethite.